Take 2 minutes to revamp your daily routine so that your productivity can be skyrocketed! Click the video below to watch the recording of the January Group Coaching Call. Call notes are below the video. 00:00 Welcome and individual check in’s. Share your successes this last month and your challenges. 15:00 Tossing up ideas about connecting more. Suggested the idea of accountability partners within the M+M group. Everyone attending gave feedback. 20:45 We talked about staying more connected as a group. If you weren’t on the call, please let me know your answers to the questions I asked. 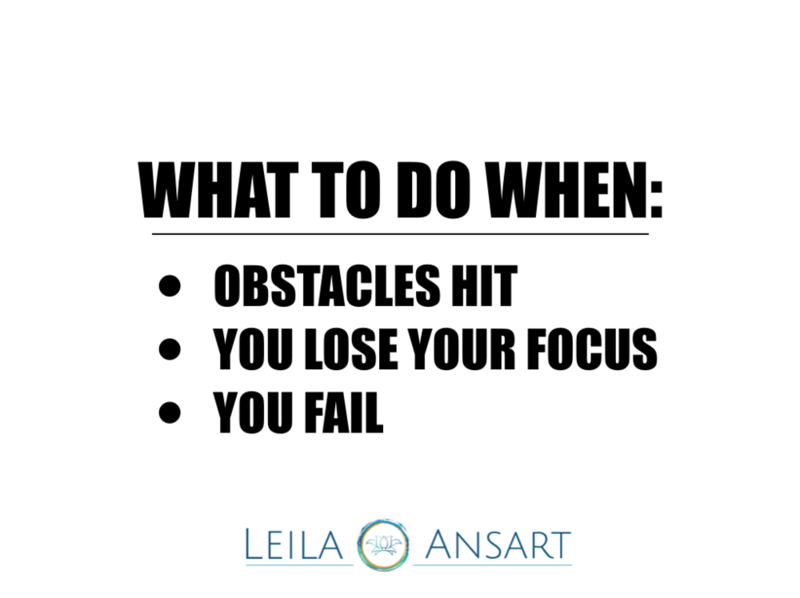 24:15: Presentation started; What to do when obstacles hit, you lose your focus or you fail. 28:45 Notice where you are in your journey since program started in January. Practice mindfulness + acknowledge your blocks. 30:50 When lasting change/growth typically happens and why it matters to your outlook to understand this. 23:00 What one actionable are you going to implement? After watching this, email me your answer! So it’s your turn to have your Mastermind’s attention and expertise. You are in the hot seat! How do you frame your topic so you get the most out of your experience? I’ve been a part of many hot seat discussions and it’s a bit frustrating when the person in the hot seat goes on a rambly explanation for 5-10 minutes on their topic. They try to share (or show) you what they are working on, and you aren’t sure which part of their explanation is important and which part is just ancillary details. 1. Identify a topic you would like feedback on. What topic could you gain the most from if you had a panel of advisors helping you? Brainstorm your options, if needed, and choose the one that is the most pressing for you right now. 2. Get Clarity on exactly what you want to know. Don’t wait to process your thoughts at the meeting. Think through your topic in advance and condense your thoughts down to 1 question you’d like an answer to. After you ask your question, you can tell the ‘back story’. Consider sharing the history of what’s happened so far, where you are stuck, what your thoughts are around this subject, what you’ve already tried, and how this situation relates to your goals. Presenting your topic in this way allows the other members to not get sidetracked by the multiple possible directions your conversation could take us and really focus on your 1 primary question. 3. Write down your 1 question, and if forethought is necessary, email the group to present your topic a day or two before the meeting. Most topics don’t need to be sent out early, but consider this in case it would be helpful. In addition, be prepared to take notes, and take the necessary steps to ensure you arrive early for this meeting. The last thing you want crowding your mind on this day is guilt for running late, worries about forgetting something, etc. 4. Remain open-minded and curious. Being in the hotseat can sometimes be a humbling experience. Hearing how others view what you’ve worked on may be in opposition to your initial way of thinking. Set an intention to set your personal feelings aside for the hour and just listen curiously to the feedback given. If you find yourself getting defensive, take a deep breath and explain what you’re feeling. Own the feelings, and remind yourself that everyone is there to support you and help you succeed. If someone’s feedback doesn’t make sense, don’t be afraid to ask questions to clarify. 23:00 The 1 question I ask the group. After watching this, email me your answer!